inversion of a thin sand interval. The sands are the higher impedance values coloured in blue. 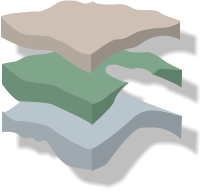 Note how the image suggests the presence of continuous, thick sand connected to the well. As geophysicists we all know that seismic inversion is not unique. But are you aware just how uncertain conventional seismic inversion impedance estimates really are? Stochastic inversion realisation #0001 Note how in this realisation there appears to be a well developed sand on the left of the image, but it appears to be isolated and not connected to the well. Stochastic inversion realisation #0002 In this image there appears to be a single, much thicker sand than is observed in the deterministic inversion. Stochastic inversion realisation #0003 Now the image seems to imply three stacked sands, the upper sand probably in communication with the well. Stochastic inversion realisation #0004 A final image, interpreted as a sand in communication with the well plus a deeper, separate sand (possibly two channels) to the left. Low Cost. No Fuss. Most stochastic inversion algorithms are slow, expensive or both. Earthworks has developed an ultraFast stochastic inversion methodology. No outrageous pricing or long turnaround times. We offer a turn-key service, either extending your existing deterministic inversion study or by undertaking a complete inversion study from wells and seismic. To find out more about our technology take a look at the Technical Guide. Alternatively, perhaps you are interested in purchasing a Software Licence to use our technology?